Nuby Nappy Pin - Set of 4 | Yellow | Durable and Safe. Fasten your baby’s nappy with utmost safety with the help of these nappy pins. 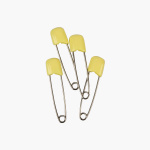 Made of good quality material, these pins are rust-proof and sport a plastic headlock. Feature 2 : Made of rust proof stainless steel. Feature 1 : Durable and Safe. Feature 3 : Plastic head lock with ensuring safety.